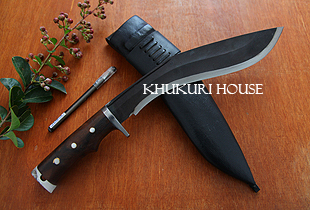 Of all the so called Jungle Khukuri blades, comes a New Jungle into the stable of Khukuri House, known as Jungle Black. Its Bigger, its better, its more powerful, a fresh new design and its Black. Of all the so called Jungle Khukuri blades, comes a New Jungle into the stable of Khukuri House, known as "Jungle Black". Its Bigger, its better, its more powerful, a fresh new design and its Black. 1. 12 inches long blade. More longer the merrier. More longer reach and more affective. 2. A fuller or chirra forged into the blade adding more class to the blade. 3. Black surface on the blade giving it a Rust free look no reflection from the blade when you are in the stealth mode. 4. New improved handle like many other khukuri which has hand guard for safety and comfortable grips. If the Jungle is where you live and belong then its the metal friend you must have as your gear.